These days everyone wants to look younger with bright, beautiful and glowing skin. ‘Olay’ is a wonderful beauty product to help assist this and has a wide range of skin care products on the market. Continuous application of ‘Olay’ helps to achieve healthy and beautiful skin. I have been using Olay for many years and have seen a drastic change in the texture of my skin. The best part is that it consists mainly of natural ingredients and does not have any side effects. 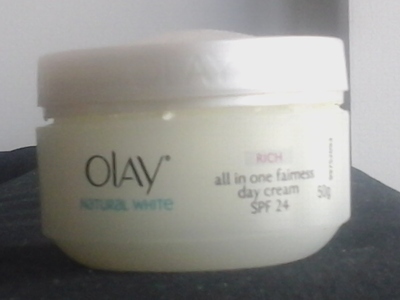 This is a whitening moisturiser in a small container which provides an instant glow to your face. It is very good for oily skin and makes you feel fresh without a greasy feeling. I used to have a lot of acne on my face due to my skin being oily, within a few months of usage of this cream, most of the acne along with the blemishes disappeared. The Olay Regenerist Micro-sculpting Cream is an amazing product to make the skin flawless. It re-energizes the skin by penetrating deep into it, as well as helping to reduce wrinkles and the appearance of lines in a matter of few weeks. As the name itself suggests, this cream is designed to make us look younger and protects our skin from harmful UV rays. This is best suited to people who spend maximum time doing outdoor activities under the sun. This moisturiser is oil free and does not leave a greasy effect. It helps to tone the skin as well. Olay Fresh Effects is a moisturising sunscreen lotion with a lovely floral fragrance. It is good for people with dry skin, as it hydrates, and it also protects skin from harmful sunrays due to the high amount of SPF (sun protecting factor).